tgomagazine.co.uk">TGO Magazine. 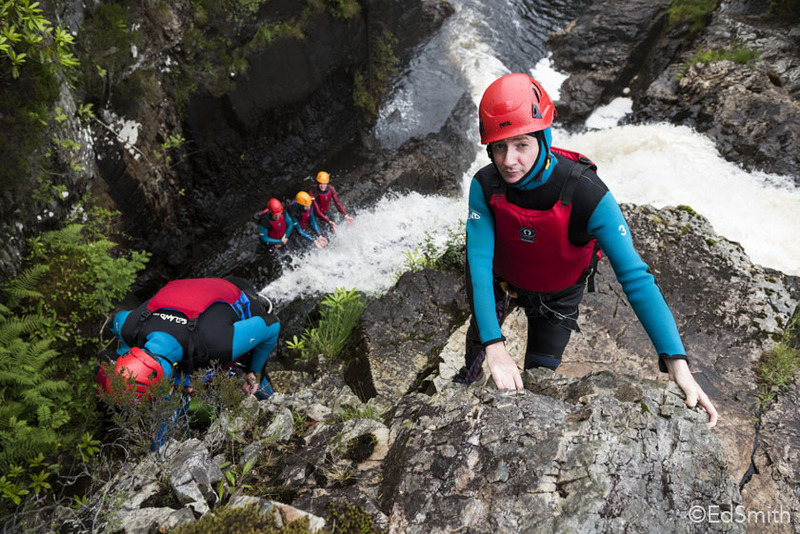 Photography is brilliant in that it provides constant variety, particularly in the outdoor world, and I certainly couldn't foresee that I'd be photographing a comedy legend as he jumped off and scrambled behind Inchree Falls near Fort William, used by Vertical Descents on their canyoning tours. Whilst it's all fun and games on the surface, and as our guide Daryl had safety in mind, I always feel a sense of responsibility for those in front of the camera in environments like this. 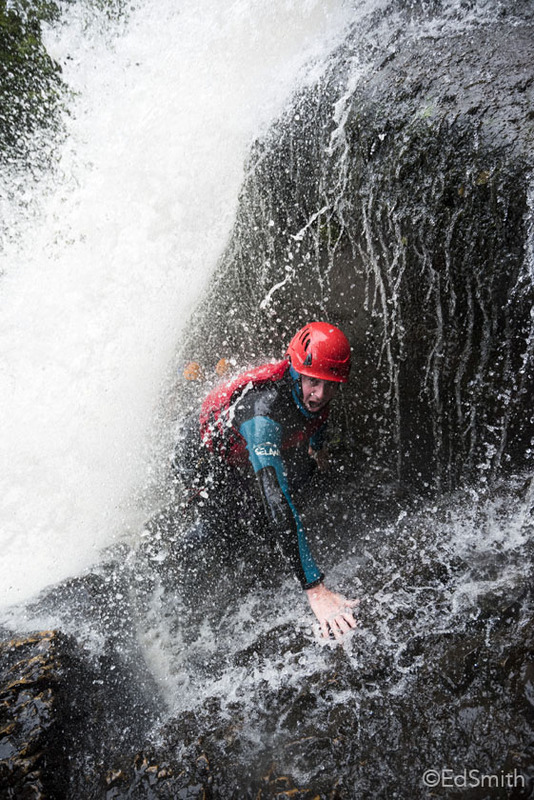 Despite Ed signing his life away, the seconds whilst he was out of sight beneath a waterfall were a little anxious on one occasion. 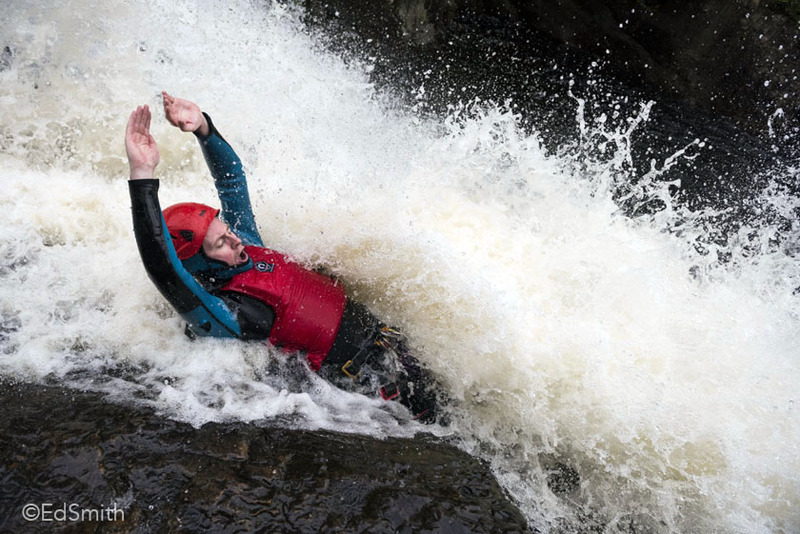 With the continuous shutter going, I had a strobe-like view of Ed falling thirty feet off axis and hitting the deep pool a little short of the softer white water at the base of the fall. I remembered him saying he had a gig that night, and relieved to see he hadn't done any damage to himself, I apologised for not mentioning that he 'didn't have to do the big drop for the camera', to which he responded 'ah, but you kinda do'. Following on from a cool shoot in a stunning location, it's interesting to chat with people who are keen to know about kit used in accessing various outdoor environments with cameras. I did toy with using a simple but fully sealed housing that could be submerged for this shoot. 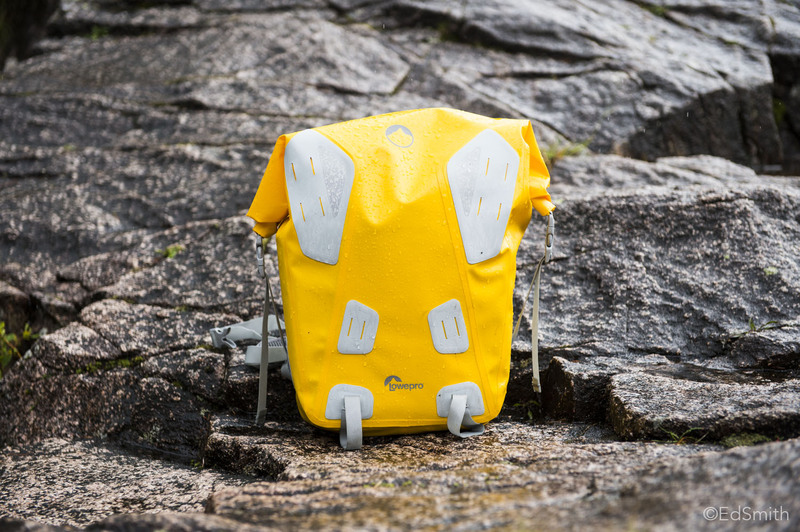 But considering how peaty brown the water was, and that the spray in the air would clog up the front element of the housing above water, I came to the conclusion that my camera would be better off in a padded waterproof pack. I used a Lowepro Dryzone 40L Backpack and did a run of the canyon with Daryl prior to Ed's arrival so that I knew where to be at decisive moments and only had to expose the camera to the elements for short periods of time, as I could quickly tuck my D810 back into the pack with the roll top. It's also a good tip to keep a small towel in the top of a pack like this. This is how I've approached whitewater kayaking for many years using the smaller duffle.